Vincent Willem van Gogh moved to ARLES hoping for refuge at a time when he was ill from drink and suffering from smoker's cough.He arrived on 21 February 1888, and took a room at the Hôtel-Restaurant Carrel. Van Gogh was enchanted by the local landscape and light, and his works from the period are richly draped in yellow,ultramarine and mauve. His portrayals of the Arles landscape are informed by his Dutch upbringing; the patchwork of fields and avenues appear flat and lack perspective, but excel in their intensity of color. The Camargue horse is an ancient breed of horse indigenous to the Camargue area in southern France. Its origins remain relatively unknown, although it is generally considered one of the oldest breeds of horses in the world. For centuries, possibly thousands of years, these small horses have lived wild in the harsh environment of the Camargue marshes and wetlands of the Rhone delta, which covers part of the départements of Gard and Bouches-du-Rhone. There they developed the stamina, hardiness and agility for which they are known today. The Camargue horse has long legs which are well proportioned, strong, and resistant,with large knees and hock. Their hooves are hard and tough, with soles that are large and wide, suited to its original marshy habitat. "NEXT TIME I WILL RIDE ONE OF THESE FABULOUS HORSES THROUGH THE MARSHES AND SURF"
In June 1888 Van Gogh took a 30 mile stagecoach trip from Arles to the sea-side fishing village of Saintes-Maries-de-la-Mer on the coast of the Mediterranean Sea . Van Gogh's week-long trip was taken to recover from his health problems and make some seaside paintings and drawings. At that time Saintes-Maries was a small fishing village with under a hundred homes. This inspired him to create. several seascapes. One such seascape Van Gogh paintedwas The Sea at Les Saintes-Maries-de-la-Mer in which he sought to capture light's effect on the sea. He wrote that the "Mediterranean Sea is a mackerel color: in other words, changeable – you do not always know whether it is green or purple, you do not always know if it is blue, as the next moment the ever-changing sheen has assumed a pink or a gray tint." The setting includes fishing boats returning to the village. 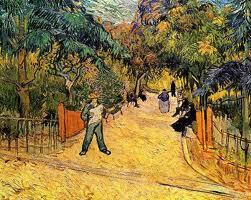 To emphasize contrast to the color green in the painting, Van Gogh signs his name in large bright letters. Seascape at Saintes-Maries (Fishing Boats at Sea) was painted six years after Van Gogh wrote that he wished to paint a seaside painting of sand, sea and sky. In this painting the combination of a high horizon and boats close to the top edge of the frame, draw the audience in to the choppy sea in the foreground and center of the picture. He also made three drawings of this composition.